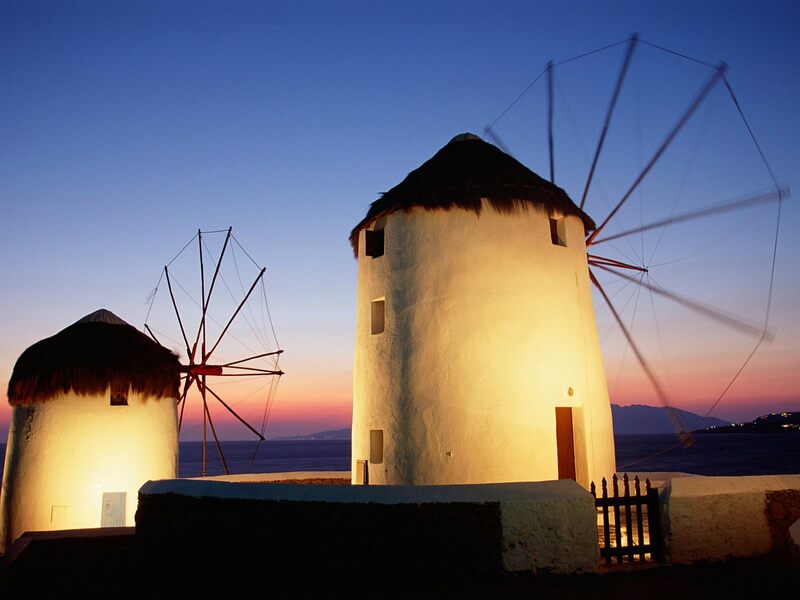 From as early as the 16th century one of the most recognized landmarks of Mykonos have been the windmills. Due to it”s geographic position, Mykonos was situated on major sea trade-route which at one time joined Venice, the gateway of Europe, to Asia. 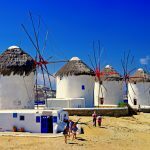 The need to refine grain and compact it for transport combined with an ample year round supply of wind made Mykonos the perfect location. Easy access to the harbor was necessary so most of the island”s mills were positioned in or around the main port with the highest concentration covering the entire western portion of town. With the coming of industrialization the windmills importance began to decline as well as their numbers. 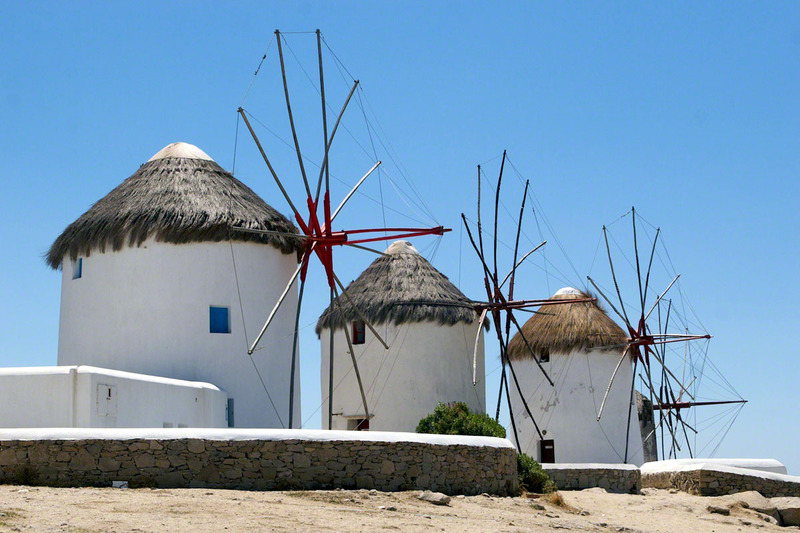 The cluster of Kato Myloi (Lower Windmills), which rise proudly over the sea, on the small hill southwest of Hora (the city of Mykonos). 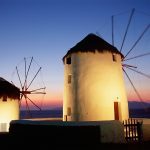 The windmills Kato Myloi are situated southwest of Mykonos Town – Hora, next to the sea, between scenic Alefkadra and the quarter of Niohori, and impress every visitor with their snow-white magnificence, built in a row, looking to the sea. Today, seven have been preserved out of ten (once there were more than twenty on the island), which existed here until the first decades of the 20th century and used to grind with the unstoppable power of the northern wind the local wheat. 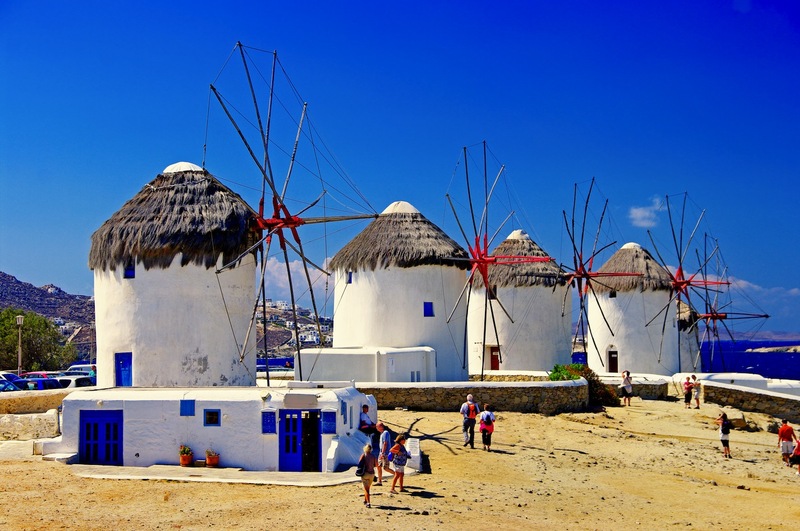 The Windmills of Mykonos, early processing units, decisively contributed between the 17th and the 19th century to the economic prosperity of the island, which, being a necessary station for the passing sailboats, supplied them with rusk. After the 1st World War, through the progress of technology they lost their financial value and were finally marked as one of the most popular monuments of the Cyclades islands and, their picture as a trademark travelled all around the world.  In 1700 the cluster with the 11 windmills had already been developed and operated. 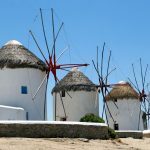 Today, the Windmill of Geronymos (private) is in the best condition, which used to operate until the 60s and, the greatest part of its equipment has been preserved.